When most people think of foreign travel they often imagine planes, trains and even ferries, but few people immediately conjure up visions of a taxi or a bus. They should, however, because these two transport options can be incredibly cheap and possibly even direct depending upon your location. If you are preparing to travel abroad, look into the availability of taking a taxi or bus in conjunction with national flights or rail services. Taxis and buses allow you to mingle with local residents of the areas you are travelling within. Taxi drivers will often take you 'the scenic way' if you are tourist, which of course generates some extra cash on the fare, but if you relax and go along with the tour you’ll very often realise that you are seeing parts of the city that tour guides wouldn’t necessarily include, or are receiving a very different commentary about the city than tour guides normally give. Similarly, travelling in a bus will allow you to sit (or stand) beside local residents. The routes of buses, and even the forms of socialising that occur within them, will also allow you to soak up a little extra local flavour. Try as they might, pre-packaged tours and itineraries rarely include such authentic interactions. Not to mention the cost of taxis and buses can be much cheaper than some services catering specifically to tourists. Travelling by taxi or bus does require some safety measures. If at all possible women should share a taxi with a fellow traveller, and women should only enter taxis that are registered and licensed. Women should never sit up front next to a taxi driver, but instead should board the back of the taxi, preferably behind some form of protective barrier. Women should always wear the seatbelts provided, and carry a map so that they can keep track of the route the taxi driver is taking. If it appears that the driver is not going to the desired destination, women should speak up immediately or even be prepared to place an emergency mobile phone call. Similarly, women on local buses should always try to keep their mobiles on and ready to use. If a bus is segregated in some way, women should respect this custom and find a seat or space to stand that is safe for them. Women should always try to sit, and should never climb on top of a bus or hanging out a step or window of a bus. If a woman believes others are taking advantage of close quarters to touch her, she should determine if the environment is safe before making a scene. If it is, then loudly telling the offender 'No!' or 'Stop!' may help. Both taxis and buses can induce motion sickness. Women can prepare for this by selecting a seat that faces forward, sitting towards the front of a bus, taking deep breaths as needed and sipping cool water as desired. Avoiding reading and writing may help prevent motion sickness, and closing your eyes or wearing dark glasses can help too. Eating lightly and avoiding alcohol are usually also good ideas. Women who know that they will become motion sick may also want to invest in wristbands designed to aid with symptoms and medication that is known to remedy the situation. These same tips hold true of motion sickness that may also be brought on while riding in a plane, train or boat. Taxis and buses may be perfectly safe in the areas within which you are travelling, but using some common sense safety precautions will help ensure this safety. Women should keep their personal possessions close to their body at all times. Passports and money should always be kept on your person. Staying awake will help women remain aware of their surroundings, and if they must lower their bags then looping a strap around an ankle will help them feel if someone tries to pull them out from underneath them. Avoid overhead bins, if at all possible, since these are open to the public and remember to gather all possessions before exiting the taxi or bus. If something is stolen or left behind, report it missing immediately with the company and get written proof of your report as your insurance company will likely require it to process a claim. 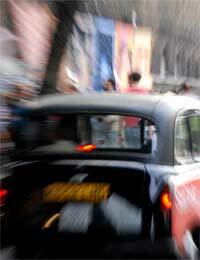 Travelling by taxi or bus abroad can be a great, cheap way to get to know more about the local culture. Women interested in such methods of transport should learn more about these systems before arriving in their destination.